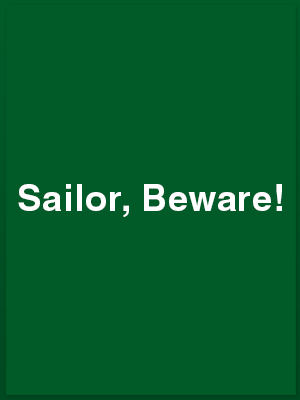 wicktheatre > Archive > Performances > Sailor, Beware! May 22, 23, 24, 25 & 26, 1979. Programme Note #1: Sailor, Beware! FM wrote: “For those of you who have supported us for more years than you may care to recall, I should like to reassure you that you are not suffering from de ja vu. The other missing ingredient and creator of this very funny play is author, friend and late President of the Southwick Players, Philip King, who sadly passed away in February. He was to have been with us this week. IF YOU THINK there’s something ‘deja vu’ about Wick Theatre Company’s 100th production at the Barn Theatre next month you will not be mistaken. Wick is celebrating with the late Philip King’s evergreen comedy Sailor Beware, a play chosen as a result of both public demand and nostalgia among the company. It was first presented by Wick in April, 1959, and six members of the original cast plus their producer Frances Moulton are linked up again for the current production. They include Clodagh Riedl who, as Clodagh O’Farrell, played Daphne Pink and has in the intervening years married and settled in Austria. She will be flying over with her husband to combine rehearsals and the play with a holiday. Sailor Beware runs at the Barn Theatre, Southwick, from May 22 to 26. JUST LIKE a jet-setting actress, Clodagh Riedl has added a touch of romance to Wick Theatre Company’s 100th production celebrations by flying from Austria specially to appear in Sailor Beware by the late Philip King. This evergreen comedy was first staged by Wick in April 1959, and Clodagh is one of six members of the original cast who have reunited for the current staging, marking the Southwick company’s ‘ton’. Clodagh is combining her play appearance with a long holiday in England, staying with her cousin in Southwick. Wick is putting on a special gala performance of Sailor Beware at the Barn Theatre, Southwick, tomorrow. It then runs from Tuesday until Saturday. CLODAGH RIEDL has travelled thousands of miles and gone back 20 years to play in the Wick Theatre Company’s 100th production. Mrs Riedl is one of six members of the original cast of Sailor Beware – performed by the group in 1959 – who are repeating their rôles in this month’s production. Mrs Riedl, who now lives in Austria was Miss Clodagh O’Farrell when she played Daphne Pink in 1959. The other people recreating their 1959 rôles are Betty and Ralph Dawes – founder members of the Wick in 1948 – Betty Elliott, Ray Hopper and Barrie Bowen. Frances Moulton who directed the original is also directing the 1979 production. She said the idea for revising the “very funny” play was a suggestion. And it snowballed. After its gala night on May 19, Sailor Beware opens on May 22 at the Barn Theatre, Southwick. It runs until May 26. BETTY DAWES turned back the clock 20 years as she swept across the stage like a human typhoon – the very essence of the domineering wife and mother-in-law. Her re-creation of the dragon-like Emma Hornet sent gales of laughter roaring round the rafters at the Barn Theatre, Southwick. It was reason enough by itself for patronising Wick Theatre Company’s 100th production, a special presentation of Sailor Beware by the late Philip King. A buzz of expectancy had preceded last Tuesday’s opening night performance. How would the six characters from Wick’s 1959 staging fit into their old rôles? Would director Frances Moulton be able to rework the former chemistry? We need not have worried. The years melted as cast and audience glorified in a hilarious tribute to Wick’s continuing success and the memory of Philip King who would have joined in the celebrations but for his death in February. Only one thing threatened to unhinge the occasion. The proceedings were so dominated by Wick president Betty Dawes that she threw a few characters into the shade. But there was plenty else to delight in. Of the original cast, Betty Elliott had us in agonies of mirth as the lachrymose Aunt Eddie who kept on remembering how she was stood up on her wedding day. This was comedy acting at its height, as was ray Hopper’s second time around portrayal of bashful Scotsman Carnoustie Bligh, the best man who finally could not resist the flirting of bridesmaid Daphne Pink. The other two ‘originals’ did not seem quite so sure of their bearings, Barrie Bowen again stepping into the sailor’s shoes of bride-groom Albert Tufnell and Ralph Dawes playing the henpecked Henry Hornett. Mind you, the whiplash of Emma Hornett’s tongue would have been enough to put anyone off. The pick of the remaining characters was Jean Porter as the outrageous Mrs Lack, always on hand for endless cups of tea and a neighbour word of encouragement. Miranda Bowen was more of a serious foil as the bride, Shirley Hornett, while Douglas Tucker tackled the rôle of the Rev. Oliver Purefoy with his thorough observation. SATURDAY was nostalgia night for me. The Wick Theatre Company’s 100th presentation was the late Philip King’s Sailor Beware, the play they performed 29 years ago and revived with substantially the same cast. How did the two productions compare? The answer, of course, is that the present one is better. In 1959 the entire cast took parts for which they were, in fact, too young – now they are playing nearer their own age groups and, of course, with greatly increased experience. Betty Dawes boomed her way through the well-intentioned termagant, Emma Hornet, now even more forbidding. In 1959 Betty Elliott was very funny as Edie – now her timing is even better. Ralph Dawes repeats his performance as the desperately henpecked Henry Hornet, devote to his Ferrets. Jean Porter is a perfect substitute for the original neighbour, Mrs. Lack, putting her foot in it with calculated persistence. Another substitute player, the original being in South Africa, is Douglas Tucker as the Rev. Mr. Purfoy who successfully solves the problems. The two sailors, Albert Tuffnell who arrives to marry Shirley Hornet and his best man, Carnousie Bligh are played by the originals, Barrie Bowen and Raymond Hopper. Once again experience tells. Shirley is played with charm by Miranda Bowen. But it is Frances Moulton’s direction that the experience of the passing years is most evident. The whole thing moves a lot faster. It is not often an amateur company has the capacity to keep an entire audience hooting with laughter. I advise you to try for a seat at tonight’s or tomorrow’s performance at the Barn theatre, Southwick. Tuesday was a gala occasion for Wick Theatre for it marked the opening of their 100th production at the Barn Theatre, Southwick Community Centre. They have chosen Philip King’s ageless comedy Sailor Beware. Included in the cast are some of the players who were in their 1959 production of the same show. Betty and Ralph Dawes, founder members from 1948, play the Hornets, with Betty Elliott as Aunt Edie, and another member from the early days, Jean Porter, as Mrs. Lack. Barrie Bowen can still get into the costume of Albert Tufnell, though Ray Hopper admits he cannot get into Carnoustie Bligh’s! Clodagh Riedl plays Daphne Pink, the part she took as Clodagh O’Farrell before her marriage. Although living in Austria, she arranged with her husband to fly over to combine the play with a holiday. Producer of the show which runs until Saturday, is Frances Moulton.